Was Morgan Freeman recommended to me because of my name? 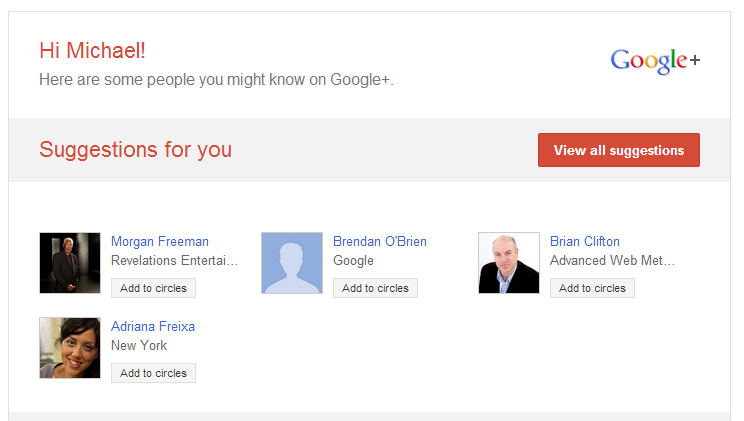 So, yesterday I get a Google+ email with suggestions for people I should add to my circles. I was a bit surprised to see Morgan Freeman listed first in the list. I enjoy pretty much all of his movies and think he is a great actor, but I have the feeling that Google recommended him because we have the same last name. Who knows what goes on in the secret sauce of the recomendation algorithm, but this one seems a bit off. I have no idea who Brendan or Adriana are. Perhaps Google could do something like Apple's Genius recommendations and at least give a hint as to why or how they think we are connected. I wish Morgan Freeman were my uncle! When living in Spain and telling people my last name, I always had to say (in Spanish) "you know, Freymann like Morgan Freymann." Sometimes I even was able to convince a few people that we were related and he was an uncle of mine (by marriage). I wish. 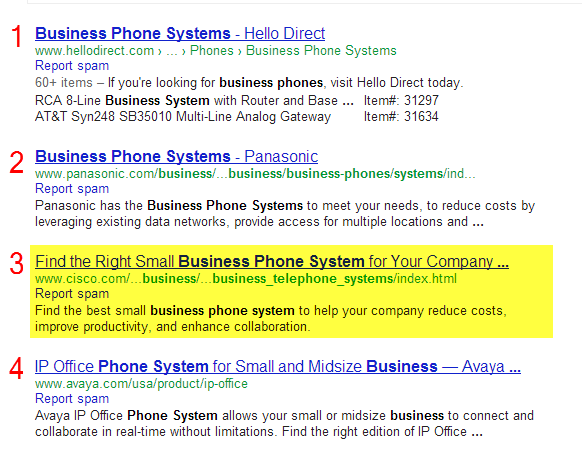 @Google: How is this a good search result for business phone system? 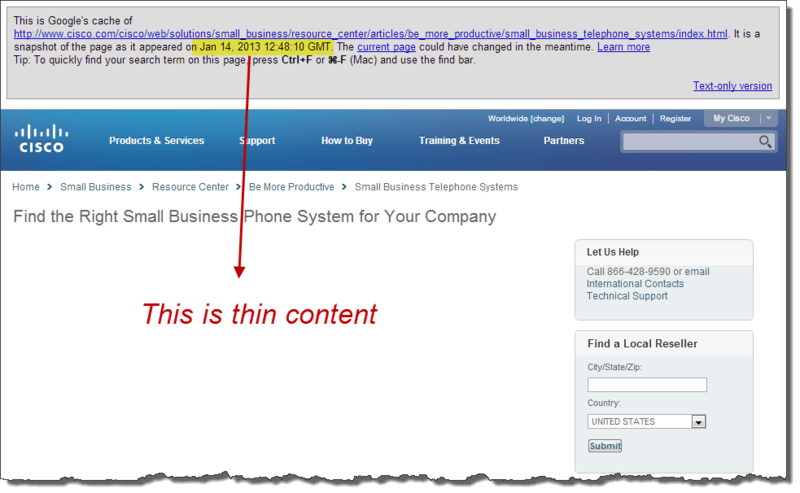 UPDATE 01/24/13 - Cisco finally fixed their CMS. 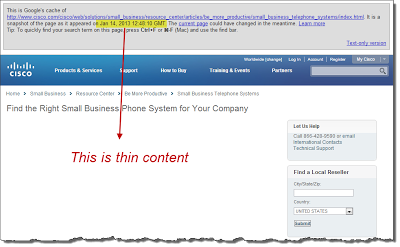 The formatting is still broken on the content but at least it is back on the page. For Google, it does not seem to matter either way because they rank #2 as if nothing ever happened. UPDATE 01/22/13 - The Google cache has been updated to show the blank page and it still ranks #2. Amazing. Talk about giving Cisco the benefit of the doubt. UPDATE 01/21/13 - Cisco still in position #2 and they still have an empty page! At least a week with absolutely no real content in the page, which is clearly broken. You'd think that even if Google doesn't notice the problem, Cisco would at least notice by now. Does anyone actually manage this part of their website? UPDATE 01/17/13 - Cisco has moved up to position #2 and they still have an empty page! Both Google and Cisco are asleep at the switch on this one. It's been more than 3 days since their content has been MIA (I doubt I happened to find the page right when their CMS broke). I am getting familiar with the telecom industry in search as part of my job. Each industry has its own nuances, players, and idiosyncrasies. One thing that is common is that from time to time you will find head-scratching results in the SERPs (search engine results pages). Often it is because someone is having a bad day (site is down, CMS error, hosting provider makes a DNS mistake, etc....). Other times, it is because Google just has not yet gotten around to updating their index for a particular term. They may get to it eventually, but sometimes they are a bit slow to update the results even though the underlying content and/or competition has changed for a given topic. It is impossible for Google to stay on top of each result and each page for every term at every second of every day. But then again, when you listen to Eric Schmidt, he thinks that the whole concept of showing a list of search results is a failure. Nice position, there should be good content behind that link, right? Now, that is what I call a generous use of white space on a page layout. My guess is that the CMS is broken or someone at Cisco has inserted some code (perhaps to trigger the chat window) which prevents the main content from displaying. After navigating a few different pages, it looks like the problem may be pretty serious because I found multiple "empty" pages today on their site. I'm curious though at what point does Google take this into consideration into changing rankings/indexed status of such a page. The last cached copy from Google is January 3rd, which at least did have real content in the page (not great, but at least something). So we know that it worked correctly 11 days ago, but not sure when the page stopped working correctly. Even when working correctly, the page content did not satisfy the promise made by the headline. It listed off some features/functionality that users should consider but it did nothing to actually educate visitors on what those features mean, not the tradeoffs or factors are to consider with regard to the list of features. It also makes sure to mention that you should talk to a trusted adviser (translation - Cisco reseller). Why can't Cisco just clearly educate the visitor right on this page? Furthermore, it lists the next step as a link to learn more about Cisco's solutions, but when you get to that page it is just a list of their products without any guidance to what you should be looking to learn or how it fits together. Obviously, I am biased, but I think the content we provide is better. You be the judge. Sometimes our sites don't behave as they are supposed to. Let's just hope that if these problems persist, Google will get around to taking that into consideration in the rankings, even if the site is famous. Otherwise, that is an unfair advantage for "big" sites. Google should not protect the 1% sites any better than the 99% when mistakes are made. We've left Spain and moved to the happiest place in America. Even Oprah agrees. I've started working for ShoreTel Sky, a cloud based business VoIP service in their Marketing department. First time working from home. Required some adjustment, but so far going well. Surfing much more....the Pacific as a few more waves than the Mediterranean sea. No more weekly basketball games. Switched over to futbol (soccer) instead. Trying to pickup my tennis game when I can. Overall, it has been a very good transition. We miss our family and friends back in España but we´re now with other family here and starting to make some new friends (as well as see some great old ones too). Now that I have rediscovered the blog, I hope to get back to writing some more. Need to find some time to keep improving GA Evolution. I have received some great feedback on good features. In progress, but no ETA on the next rev. Hope in the next few weeks to get the top items completed. 2013 is looking great so far and excited to see where it leads.